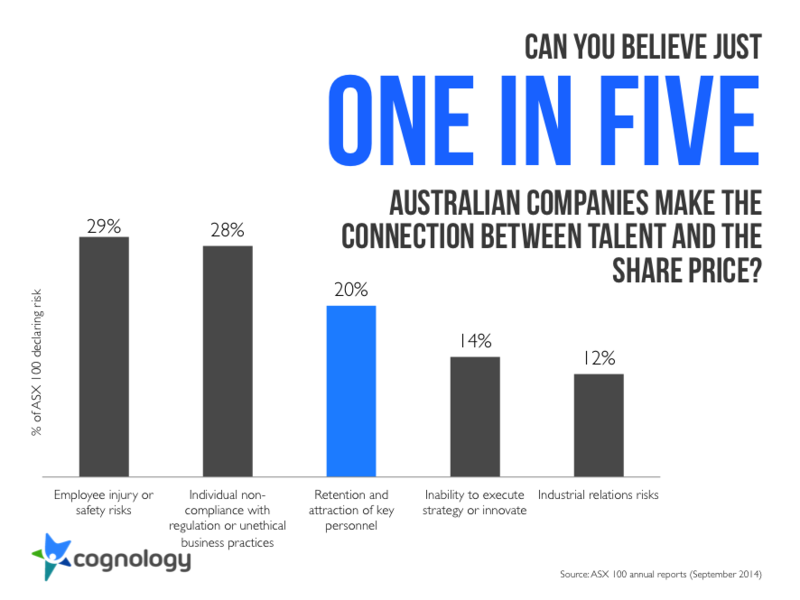 Why is Australia ignoring talent management and recruitment risks? Why does employee attraction and retention matter? And what should we do? In my previous article on people risks in the ASX 100, I stressed the point that people are one of the biggest risks that all companies need to consider. This means the attraction and retention of critical staff should be a key priority for all boards and executives. In case you missed part 1, here’s the quick recap. Only 50% of ASX 100 companies declare any people related risks to investors in their annual report. This falls to just one in five companies declaring the importance of attracting and retaining top talent. You can see the quick summary on key people risks as declared by the ASX 100 below. You can see the breakdown by sector above. What we found really interesting here is how the healthcare and science sector makes no mention of attraction and retention. It’s common knowledge we don’t have enough science and technology graduates, so why do none of the top health and science companies declare attraction and retention as a risk? It seems that everyone is proclaiming a STEM shortage (apart from the companies who actually work in the industry). And what about best practice at a company level? Talent risk is only set to increase: So what should boards and executives do? As I’ve written about previously, we’re going to have more positions than people very soon. Companies of all sizes need to be thinking about how to attract and retain top performers now, before the talent crunch hits. As our economy continues to grow faster than our population, we’ll have more jobs than we have people to fill them. And as we touched on recently in our investigation into average employee value, companies have more invested in each individual employee than ever before. As that research showed, the future of work is likely to feature increasingly smaller companies with larger valuations. In this future, each individual employee is worth more to their organization than ever before. And as we all know, the smaller the organization, the larger the talent risk. Recommendation 1: The risks around retention and attraction need to extend to more employees than executives and board members. Most of the mentions of attraction and retention risks we found pertain to board members and executives. There’s no doubt that these people are key single point sensitivities. And they should be recognized as such in the annual report. But there’s almost certainly other roles that are just as hard to recruit for (and are just as sensitive in terms of performance of the organization. There are sections in every annual report on the bonuses paid to board members as retention incentives. But there’s almost no mention of how to attract and retain top employees in any other part of the company. The recent underperformance of 2dayFM in Sydney following Kyle Sanderlands departure provides a very practical example of why key roles don’t always have to sit in the c-suite. You need to have strategies in place to retain all your top performers regardless of what they do. Of course you want the best board members and executives, but talent risks and seniority aren’t always one and the same. Investors care about the risks to company performance, not the risks to the most senior staff. There’s a big difference here that is missed in just about all annual reports. 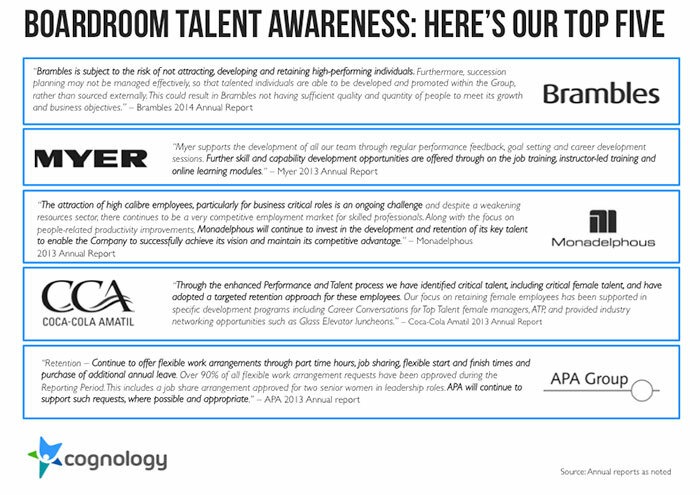 A lot of annual reports mentioned the importance of attracting and retaining top talent, without explaining how. You can talk retention all you want, but it’s critical to have a strategy to back it up. In the same way, an annual report wouldn’t say the organization was planning to double business output without explaining how. Clear disclosure about the attraction and retention strategy is key information for investors in understanding how likely a business is to succeed in the near future. In the examples above, Coke and APA do the best job of not just setting out the importance of talent to the business, but also clearly stating key strategies for retention and attraction. With Coca Cola, it’s about targeted networking and career conversations. At APA, it’s all about flexibility. It’s very easy to understand that they were written by a manager at the front line with actual experience in retaining staff. Whilst I love Brambles statement on the importance of their staff and talent – it’s very hard to understand what that actually means in terms of actions that managers are expected to take day-to-day. Have you got another board level talent recommendation you’d like to see implemented across Australia’s largest companies? If so, I’d love you to join me on Twitter @Cognology and let me know your thoughts. I’ll publish and retweet any great suggestions over the coming week. https://www.cognology.com.au/wp-content/uploads/2014/11/Talent-management-risks.gif 210 210 Jon Windust https://www.cognology.com.au/wp-content/uploads/2017/01/Cognology-logo-colour-300x101.png Jon Windust2014-11-18 00:03:422015-06-05 01:41:45Why is Australia ignoring talent management and recruitment risks? Are Millennials really changing the way we work? Who are Australia’s most valuable employees?